Yes, i am having a new project, but thank God, for the first time, the project is not the usual laboratory academic style project that i am having all these while. it might be educative, informative and hmmm…. it does have some entertainment value as well. i am having a food review blog with my bf! ahem, sorry for the not so gracious laugh, but finally, our first baby blog was born. Have been planning for a while now, but never put into real action. Both of us have the same crave and appetite for food. In fact, our usual date always end up with bloated stoamch. My bf used to be a cute chubby fat boy during his puberty days, However, he had put a lot of effort and thousand hours of jogging to get to his current shape, i do worried that i might cause all his effort going down the drain, BUT amazingly, he still able to stay fit with our constant ‘grandeur’ dining out, thanks to thousands hours more of jogging. Thank God that I have the advantage of not easily get fat. Eat thousands calories of pork fat and yet it didnt turns into lipid. thats why i must have this food blog project, so that i can eat more and blog more to ensure that this heavenly gift does not wasted. 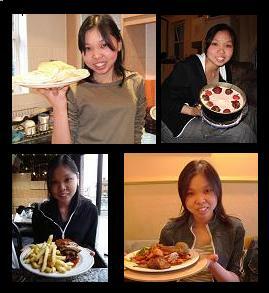 Anyway, i will be writing review on English food for a while, and some of my ‘experiments’ as well. Alimento para todos!! Hey readers! Welcome to this blog on food. My girlfriend and I decided to do this blog as a project we could do together as a couple to tell the world about our culinary adventures which will span into any kind of cuisine we can find. You can expect photos and reviews of the places we will be eating. To be upfront, the both of us are not very good photographers but with practice from all the food photo snapping, we’ll get better.